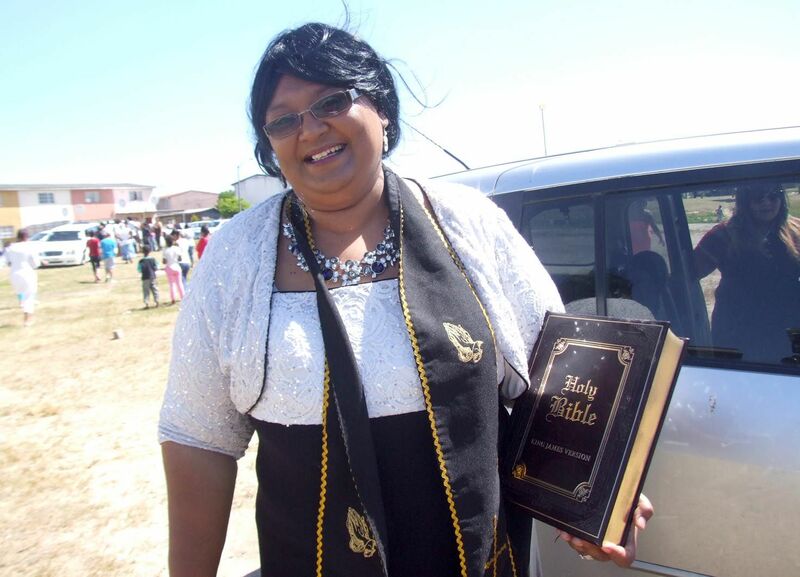 Pietermaritzburg pastor Tanelle Welft-Dixon, 43, said God asked her to marry people who have been “living in sin” or who couldn’t afford to wed. The Scottsville couples all tied the knot last Saturday and had a joint reception afterwards. The mass wedding was arranged in just three days, and everything was sponsored – from the clothing, rings and flowers to the two limousines who transported them to their paid for wedding reception. In fact, while the pastor was marrying them, she received a call from a relative at a farm on Joostenbergvlakte, who offered to have the wedding photos taken there. Pastor Tanelle, who hails from Durban, says she was just doing God’s work. “Last week I had a vision from God, I saw white wedding tables. This was during my two-week campaign of ‘praying until something happens,’ she says. “I asked God to reveal his plans to me, and the message was that I should marry those who have been living together, or who did not have money for a wedding. “I announced this in church, and the couples came forth and admitted that they no longer wanted to live in sin. One of the couples who has been living together for 35 years say they’d lost all hope of ever tying the knot. Willem Wence, 54, says he immediately asked his common-law wife Trui Diedericks, 47, for her hand in marriage after hearing pastor Tanelle’s sermon on shacking up. “She immediately said yes, because we wanted what’s best for our children,” he says. Blushing bride Amina de Vos said her biggest moment was when her husband Gerrit Corner belted out Whitney Houston’s hit song, The Greatest Love of All at the reception. “He’s always been my greatest love,” she says. That is beautiful. Bless you pastor for your obedience. That is also prophetic….the Lord wants us all ready for He is coming soon. Well done pastor; a great initiative to show grace and preach the gospel. I love it.